Stigma, poise, vigor, caliber, team spirit- few words to name, that masters the comprehensiveness of a student. The knowledge of demeanours cannot be attained from any book or pages. Open fields, a competition to win, exuberance to brim all efforts, a lust to taste the glory and above all a drop of uphill battle is what makes a student impeccable.Sports are one of the exigencies of life. 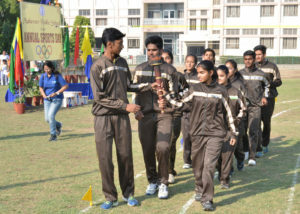 It not only entertains and soothes us but also bring out the power of concentration and a hand to support the team. At Mahaveer, we facilitate students with open sports grounds for volley ball, basket ball and cricket and also in-house games facilities for table tennis, chess, carom etc. The dynamite coaches and teachers acuminate the all round skills of young contenders and prepare them for inter school, inter states and nationals. Mahaveer stands firm of on the pr-axis of refractory triumph in every sphere we enter into.